The most important performance metric of each communication system is undoubtedly the quality of the communication as perceived by the final user. Thus, the Internet Media Group always aim at optimizing the communication on the basis of quality measures performed at the application layer, which is the layer closest to the user. Objective quality measures are often employer for their simplicity of use, nevertheless subjective quality evaluations, sometimes informal, are also employed whenever possible. 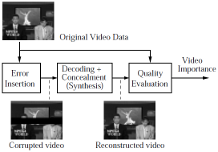 One of the most commonly employed approach in optimizing the performance of the communication is to assign to each compressed multimedia element an importance value which is proportional to the distortion that would be introduced during playback in case that element was lost. This approach has been successfully employed to build some analytical models which well approximated the expected distortion at the decoder given a certain transmission policy.